Occupying the northern third of Great Britain, Scotland has been part of the United Kingdom since 1707. The coastline of the country is deeply cut by inlets, and there are more than 790 islands. The country has a long and distingushed maritime history; many of the most famous British captains and navigators have been Scots. 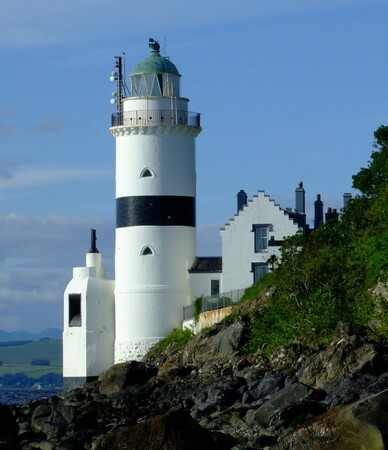 This page covers lighthouses of southwestern Scotland from the Glasgow area southward, including the the south side of the Clyde estuary and the council areas of Renfrewshire, Inverclyde, North Ayrshire, South Ayrshire, and Dumfries and Galloway. The Northern Lighthouse Board , established by an act of Parliament in 1786, manages the major lighthouses of Scotland and the Isle of Man. For five generations engineers of the Stevenson family created for the Board a network of elegant and durable lighthouses famous around the world. Most of these lighthouses remain in service today. Information on the great NLB lighthouses is easy to find on the Internet. 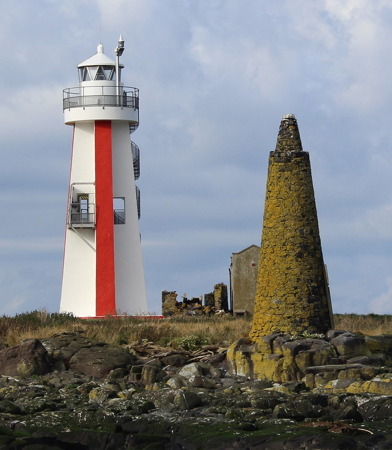 It's harder to find information on the harbor lighthouses of Scotland's many ports. Information and photos are needed for some of these sites. 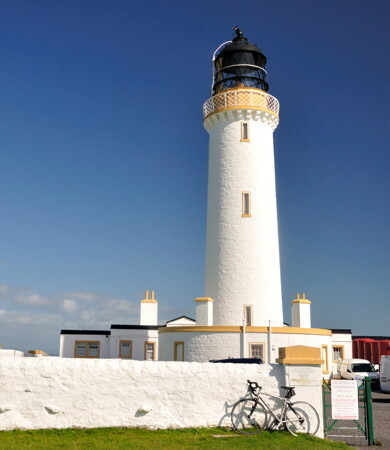 Most Scottish lighthouses are accessible by road or hiking trail, but only a few are open for climbing. The Scottish word loch is used both for lakes and for inlets of the sea; a firth is a larger bay or strait. ARLHS numbers are from the ARLHS World List of Lights. Admiralty numbers are from Volume A of the Admiralty List of Lights & Fog Signals. U.S. NGA numbers are from Publication 114. 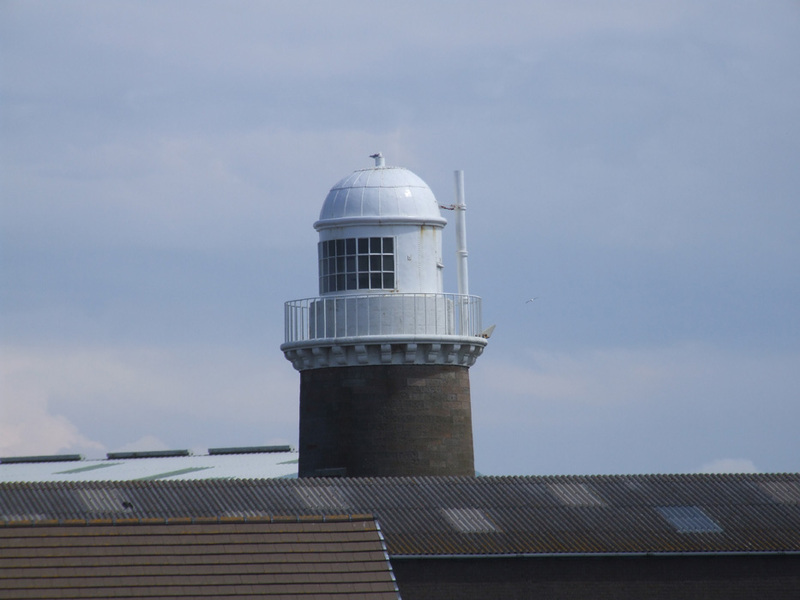 The Board's web site includes information and photos for many of the lighthouses. Data and photos posted by Michael Spencer. Section K includes the lights of the Clyde waterway. Photos available from Wikimedia; many of these photos were first posted on Geograph.org.uk. Photos posted by a German visitor. 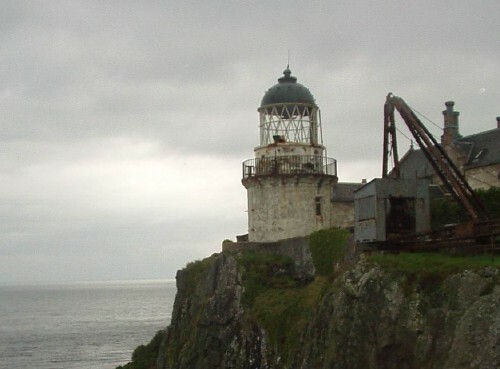 The history of Scotland's remarkable family of lighthouse engineers. Nautical chart information for this area. Note: Dumfries and Galloway is a unitary council area located on the north side of Solway Firth, a funnel-shaped inlet of the Irish Sea that separates southwestern Scotland from northwestern England. 1748 (rebuilt in the 1790s and in 1812 by Robert Stevenson). Inactive 1867-1894 and since 1933. 10 m (33 ft) square cylindrical granite tower with lantern. Tower painted white; lantern is brown. The lantern is inset into the tower with brick behind. Anne Burgess's photo is at right, a 2008 photo is available, Walter Baxter has a 2011 photo, Wikimedia has many photos, Marinas.com has aerial photos, and Google has a street view and a satellite view. 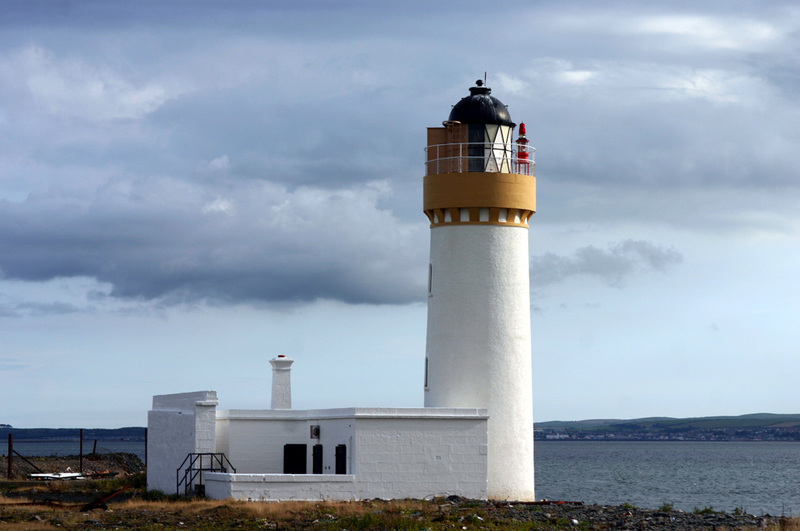 This unusual, much-altered lighthouse, the second oldest in Scotland, was originally built by the Dumfries Town Council. After the Northern Lighthouse Board declined to accept the lighthouse, it was operated by the local navigation authority from 1795 to 1867 and then by a private landowner from 1894 to 1933. The lighthouse has been refurbished and repainted recently by its current owners, who operate a nearby caravan park (RV campground). However, the lighthouse is probably endangered by rising sea level. Located on the beach under the Southerness headland on the north side of Solway Firth, off the A710 highway about 25 km (15 mi) south of Dumfries. Accessible by road. Site open and tower open, although the gallery is unsafe and is closed. Owner/site manager: Lighthouse Leisure Caravan Park. ARLHS SCO-223. 1996 (station established 1893). 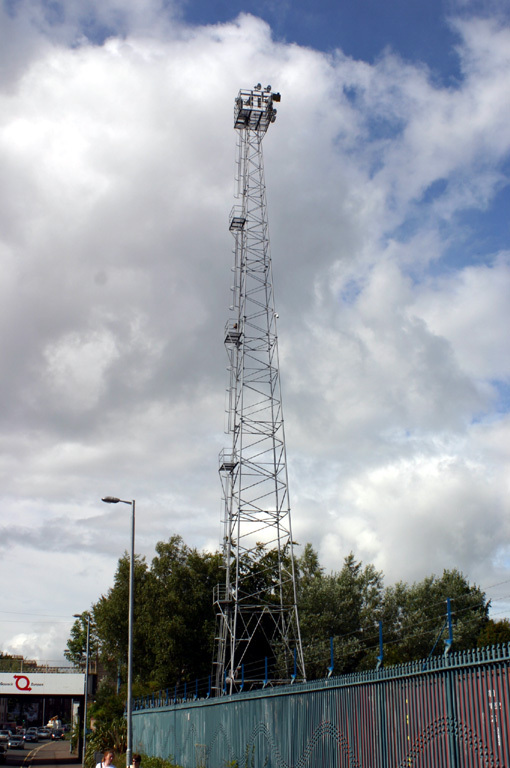 Active; focal plane 42 m (138 ft); two white flashes every 10 s. 7 m (23 ft) square cylindrical skeletal tower, enclosed by vertically slatted white daymark panels. Walter Baxter has a photo, a closeup is available, and Google has a satellite view. 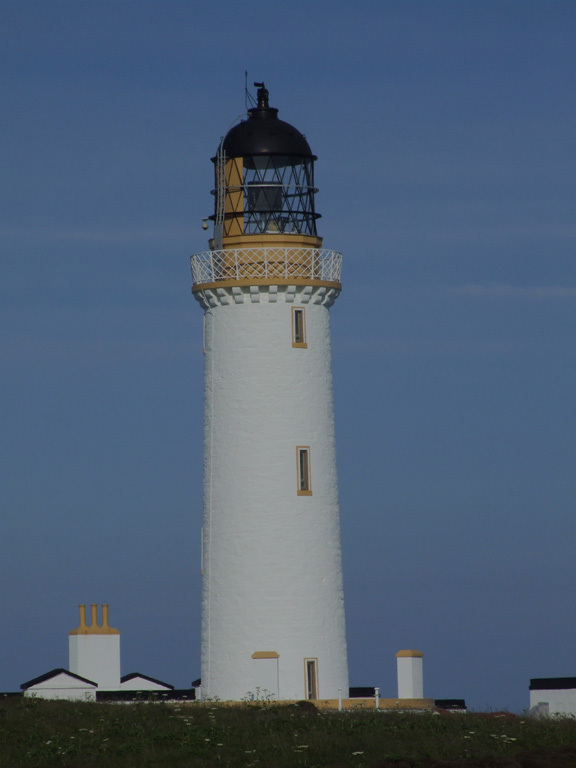 According to Wikipedia's article, a lighthouse was built on the island by Alan Stevenson in 1850, but no source has been found to confirm this and it appears to be an error. The 1893 light was on a "white store house." Hestan is a small island in the mouth of Auchencairn Bay, about 20 km (13 mi) west of Southerness. The island is accessible at low tide by a gravel bar about 800 m (1/2 mile) long. Located on heights on the east side of the island. Site open, tower closed. Operator: Northern Lighthouse Board. ARLHS SCO-095; Admiralty A4640; NGA 4832. 1843 (Alan Stevenson). Active; focal plane 50 m (165 ft); white flash every 5 s. 22 m (66 ft) round masonry tower with lantern and gallery, attached to a 1-story keeper's house. Lighthouse painted white with buff trim; lantern painted black. Trabas has a photo, Lighthouse Digest has a historic photo, and Google has a satellite view of the light station. A notorious crime occurred at this station: assistant keeper Robert Dickson murdered relief keeper Hugh Clark in August 1960. The 4th order Fresnel lens used here was placed on display at the Stewartry Museum in Kirkcudbright in December 2014. The station is now a private residence. The front light is on a 10 m (33 ft) square stone pillar. In July 2017 the 11.7 ha (29 acre) island and the keeper's house were for sale for £325,000. Located atop a small island at the western side of the entrance to Kirkcudbright Bay. Accessible only by boat. Site and tower closed. Operator: Northern Lighthouse Board. ARLHS SCO-125; Admiralty A4634; NGA 4828. Date unknown. Active; focal plane 20 m (66 ft); flash every 3 s, white or red depending on direction. 4 m (13 ft) square stone tower, painted white. Trabas has a closeup photo, and Google has a satellite view and a closeup street view. According to Mike Garrett, who has a closeup photo, this small tower was formerly a signal tower. Despite its name, Isle of Whithorn is not an island; it is a fishing port at the western entrance to Wigtown Bay. Located on Isle Head, a promontory on the east side of the entrance to the harbor (the promontory was actually an island in the distant past). Site open, tower closed. Operator: Dumfries and Galloway Council Harbours. ARLHS SCO-357; Admiralty A4624.2; NGA 4823.5. Note: The Rhins of Galloway is a hammerhead-shaped peninsula, the southernmost extension of Scotland. The word rhin is from an old Gaelic word for a promontory or point of land. 1830 (Robert Stevenson). Active; focal plane 99 m (325 ft); white flash every 20 s. 26 m (85 ft) round masonry tower with lantern and gallery, attached to a 1-story keeper's house. Lighthouse painted white with buff trim; lantern painted black. Paul Stevenson's photo is at right, Trabas has a closeup photo by Arno Siering, Wikimedia has many photos, Marinas.com has excellent aerial photos, Huelse has a historic postcard view, and Google has a street view and a satellite view. 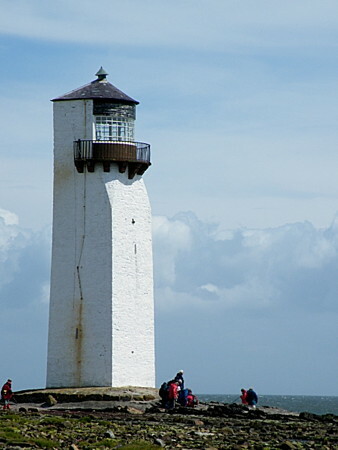 This famous and historic light station stands on the southernmost point of Scotland and at the northern end of the Irish Sea, marking the entrance to the North Channel and to the Solway Firth. It is one of only two Northern Lighthouse Board lighthouses open for climbing. The Mull of Galloway Visitor Centre, adjacent to the light station, occupies a building that originally housed the workers building the lighthouse. The keeper's houses are available for vacation rental. A coffee shop was added to the site in 2004. Much of the surrounding area is a bird sanctuary managed by the Royal Society for the Protection of Birds. 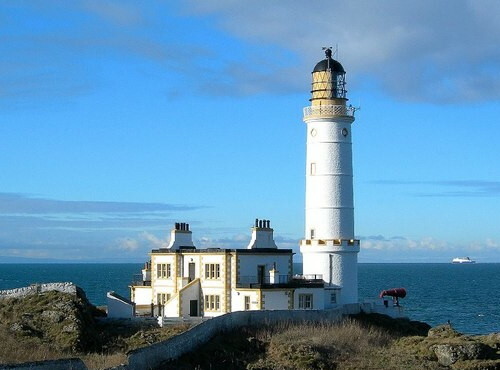 In 2013 the Mull of Galloway Trust received a grant of £338,500 to buy the Northern Lighthouse Board's property, except for the lighthouse itself. Note: the word mull is a corruption of a Gaelic word maol for a bare hill or a rounded headland; the Gaelic name of the cape is Maol nan Gall. Located atop a vertical cliff at the southern tip of the Rhins of Galloway about 8 km (5 mi) south of Drummore. Accessible by road, parking provided. Site open, visitor center open daily April through mid September, tower open daily in July and August, also on Saturdays and Sundays May, June, and early September (check the Trust web site for current information). Operator: Northern Lighthouse Board. Site manager: South Rhins Community Development Trust. ARLHS SCO-144; Admiralty A4610; NGA 4816. 2009 (station established 1913). Active; focal plane 35 m (115 ft); white flash every 10 s. 7 m (23 ft) round cylindrical fiberglass tower with lantern and gallery, painted white, mounted on a concrete pad. Trabas has Eckhard Meyer's photo, Michael Lindley has a good photo, David Hambidge has a good photo, and Google has a satellite view. The new light was activated in December 2009; a distant view of the previous light is available. 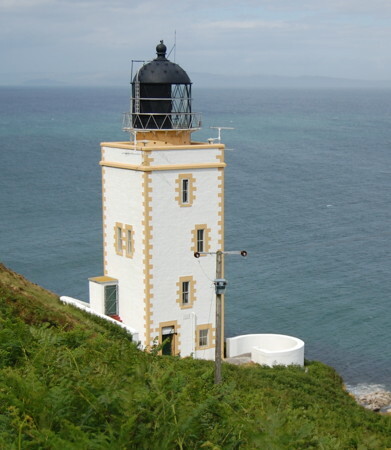 Located on a promontory about 8 km (5 mi) northwest of the Mull of Galloway lighthouse. Site and tower closed (private property). Operator: Northern Lighthouse Board. ARLHS SCO-055; Admiralty A4608; NGA 4812. Early 1830s. Long inactive. Approx. 9 m (29 ft) round stone tower with a small stone lantern, attached to part of a ruined stone harbor wall. The engineer Thomas Telford designed Port Logan Harbour around 1820, and the lighthouse was added about 10 years later. M. Campbell has a nice closeup, a 2008 photo is available, Marinas.com has aerial photos, and Google has a street view and a satellite view. The picturesque village and its lighthouse became well known when they appeared in a popular BBC television drama series Two Thousand Acres of Sky. Located at the south side of the harbor at Port Logan, about 8 km (5 mi) south of Ardwell. Site open, tower closed. Owner/site manager: unknown. ARLHS SCO-314. 1839 (station established 1833). Inactive since 1900; sometimes lit decoratively on holidays. Approx. 11 m (36 ft) round cylindrical brick tower with lantern and gallery. Tower is unpainted yellow brick; lantern painted white with a black roof. Ann Cook has a good 2010 photo, a 2008 photo is available, Marinas.com has aerial photos, Huelse has a historic postcard view, Google has a street view, and Bing has a satellite view. From 1900 to 1905 the light was shone landward as a streetlight. The original lighthouse is said to have been dismantled and shipped for reassembly in Sri Lanka, then called Ceylon. The tower is privately owned; Michael Spencer reports that the keys are kept at the Lighthouse Pottery nearby and "polite enquiry will secure their loan." 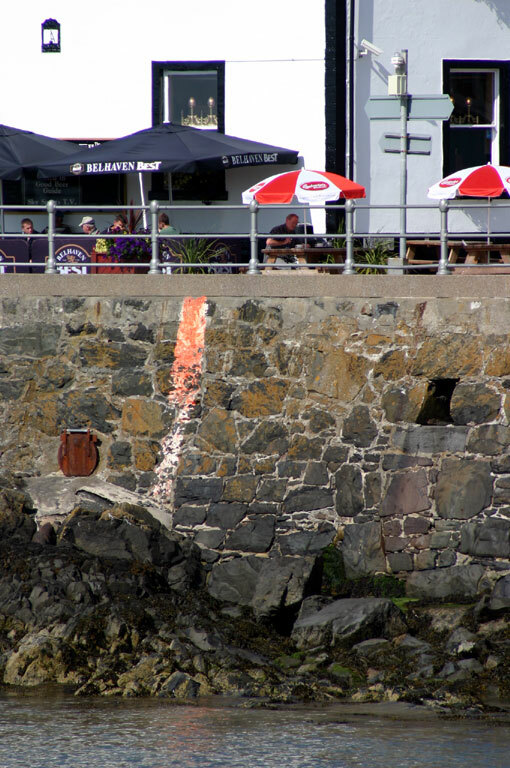 Located on the south side of the harbor entrance in Portpatrick. Site open, tower open by arrangement. Owner/site manager: private. ARLHS SCO-177. Date unknown. Active (privately maintained); focal plane 8 m (26 ft); continuous green light. 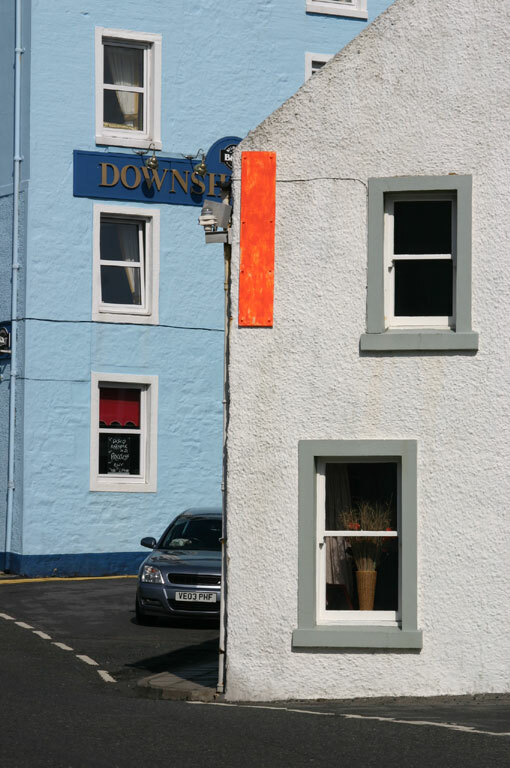 Light attached to the side of a 2-story house on the east side of Main Street, Portpatrick. Trabas has a photo, Google has a street view, and Bing has a satellite view. The front light is on a small post. Located at the intersection of Main Street and Hill Street. Site open, tower closed. Admiralty A4607.1; NGA 4808. 1900 (David A. Stevenson). Inactive since 2007. 22 m (72 ft) round masonry tower with lantern and gallery, attached to a 1-story keeper's house. Lighthouse painted white with buff trim; lantern painted black. The keeper's house is now a private residence. A 2008 photo is available, Wikimedia has photos, Marinas.com has aerial photos, Huelse has a historic postcard view, and Google has a satellite view and a distant street view. In 2015 the keeper's house went on sale for £500,000. 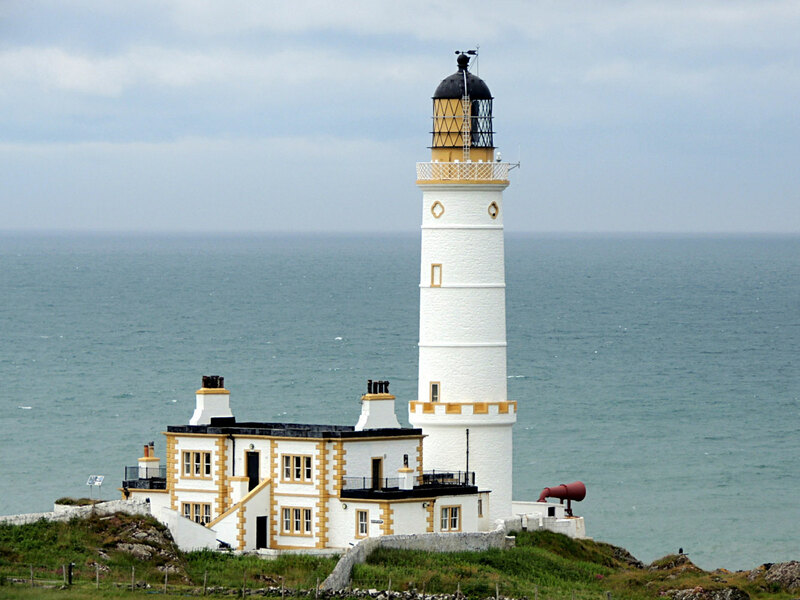 Located on Black Head, on the western side of the Rhins of Galloway about 2.5 km (1.5 mi) north of Portpatrick. Accessible by road off the B738 highway; there is also a hiking trail, the first (or last) section of the Southern Upland Way, from Portpatrick. Site and tower closed (private), but the lighthouse can be seen from a distance. Owner (lighthouse): Northern Lighthouse Board. Site manager: private. ARLHS SCO-111; ex-Admiralty A4606; ex-NGA 4800. 1817 (Robert Stevenson). Active; focal plane 34 m (112 ft); five white flashes every 30 s. 34 m (112 ft) round masonry tower with lantern and gallery, attached to 2-story keeper's house. Lighthouse painted white with buff trim; lantern painted black. The keeper's house has been converted into a small hotel. A photo by Mary and Angus Hogg is at right (note that the Irish coast is on the horizon to the left of the lighthouse), W.F. Millar has a good photo, Trabas has an excellent closeup photo by Eckhard Meyer, Wikimedia has several photos, Marinas.com has fine aerial photos, Huelse has a historic postcard view, and Google has a street view and a satellite view. 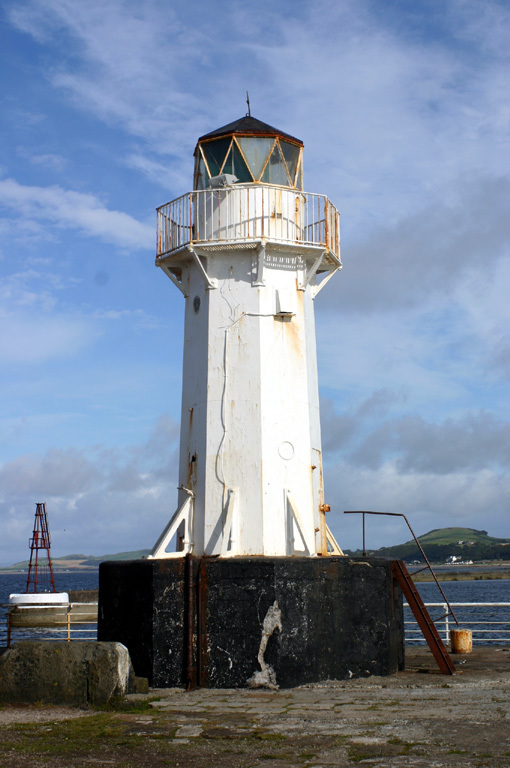 This is the landfall light for ferries from Larne and Belfast to Stranraer. In early 2008 the lighthouse and hotel were listed for sale. 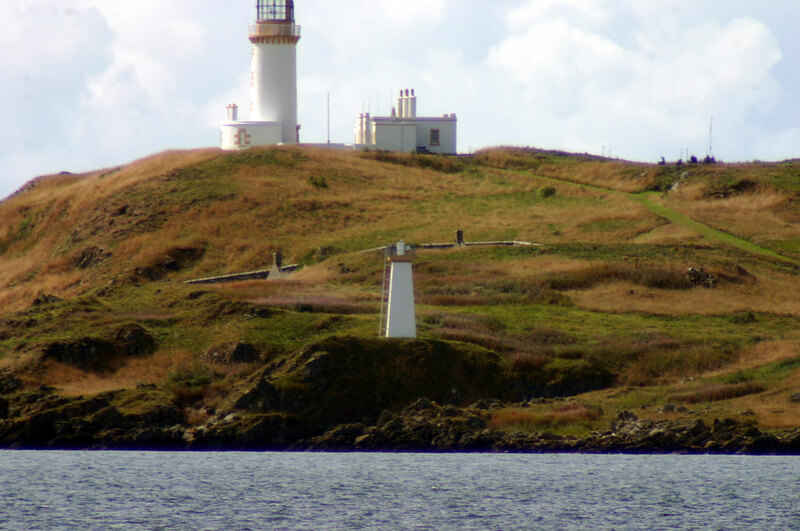 Located on the northern tip of the Rhins of Galloway about 8 km (5 mi) northwest of Kirkholm. Accessible by road. Site open, hotel restaurant open for lunch and dinner daily, tower closed. Operator: Northern Lighthouse Board. Site manager: Corsewall Lighthouse Hotel . ARLHS SCO-052; Admiralty A4604; NGA 4796. 1847 (Alan Stevenson). Active; focal plane 14 m (46 ft); two red flashes every 10 s. 15 m (49 ft) round masonry tower with lantern and gallery, attached to a 1-story equipment building. Lighthouse painted white with buff trim; lantern painted black. Trabas has a good photo, Wikimedia has several photos, Marinas.com has aerial photos, and Google has a street view and a satellite view. Loch Ryan is the sound behind the northern arm of the hammerhead-shaped Rhins of Galloway. The light guides ferries sailing to and from the Cairnryan Ferry Port, with frequent service to Belfast and Larne in Northern Ireland. Located on a promontory just off the A77 highway at Cairn Ryan, on the east side of the loch about 2.5 km (1.5 mi) north of the ferry port. Site and tower closed (fenced), but the lighthouse can be seen from nearby. Operator: Northern Lighthouse Board. ARLHS SCO-029; Admiralty A4592; NGA 4784. Note: Now divided into three council areas, the historic county of Ayrshire faces west on the lower Firth of Clyde, a broad embayment between the mainland and the Kintyre Peninsula. 1886 (Thomas and David Stevenson). Active; focal plane 18 m (60 ft); white flash every 4 s. 11 m (36 ft) round cylindrical masonry tower with lantern and gallery, attached to a 1-story keeper's house complex. Jack Boyle has a 2007 photo, Wikimedia has several photos, Marinas.com has aerial photos, Trabas has Eckhard Meyer's distant view from the sea, Huelse has a historic postcard view, Martin Armstrong has a sunset street view, and Google has a satellite view of the station. Ailsa Craig is a spectacular conical mountain, the granite plug of a long-extinct volcano, rising 338 m (1109 ft) above the sea about 15 km (9 mi) west of Girvan. The granite has long been used for curling stones. Pigeons were used to carry messages to and from the lighthouse until 1935. The lighthouse was automated in 1990 and converted to solar power in 2001. The island is privately owned, and in 2013 it was for sale for £1.5 million. In 2018 the owner placed the four abandoned keeper's cottages on sale for £175,000. The lighthouse is located at Foreland Point on the eastern side of the island. 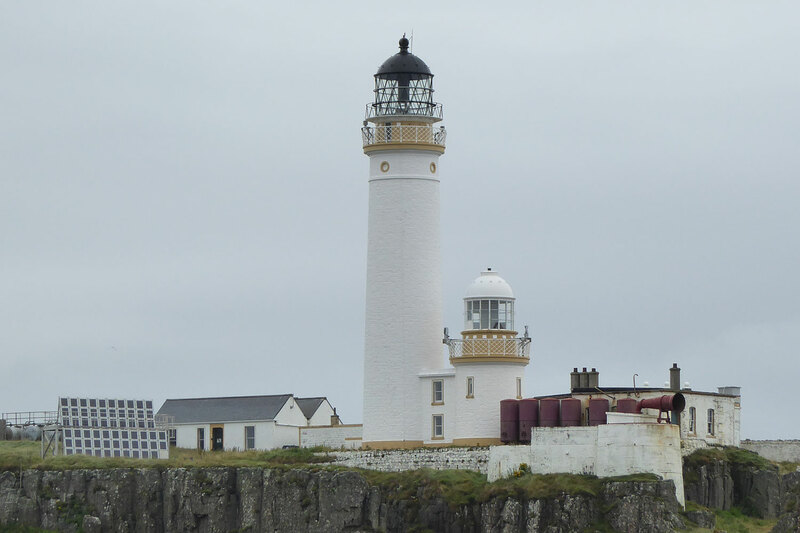 Accessible only by boat; tours from Girvan are available. Site open, tower closed. Operator: Northern Lighthouse Board. ARLHS SCO-002; Admiralty A4582; NGA 4768. Date unknown (around 1890?). Active; focal plane 8 m (26 ft); two continuous green lights, one above the other. 6 m (20 ft) round cast iron tower, painted white. Lantern removed; the lights are mounted on a short mast atop the tower. Trabas has a good closeup, W.F. Millar has a 2007 closeup, Eric Firley also has a photo, Huelse has a historic postcard view, Walter Kreis has a closeup street view, and Google has a satellite view. 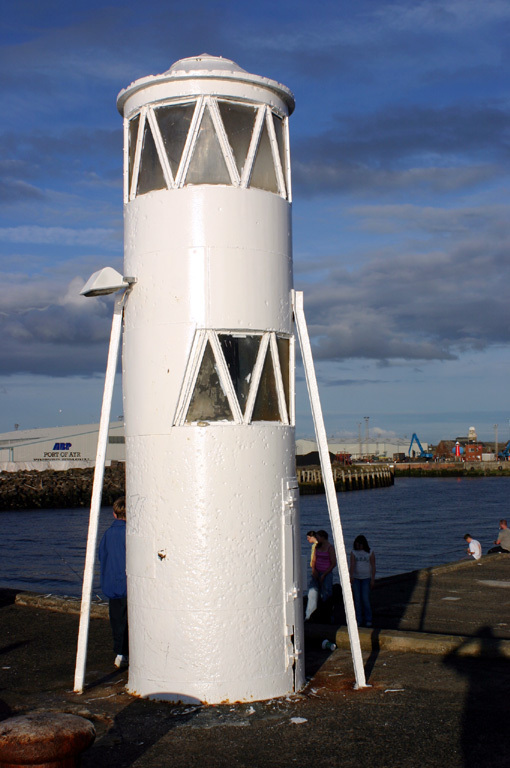 Located at the end of the breakwater at Girvan; accessible by walking the breakwater. Site open, tower closed. Operator: South Ayrshire Council. ARLHS SCO-296; Admiralty A4588; NGA 4776. 1873 (Thomas and David Stevenson). Active; focal plane 29 m (95 ft); white flash every 15 s. 24 m (79 ft) round masonry tower with lantern and gallery, attached to a 2-story keeper's house. Lighthouse painted white with buff trim; lantern painted black. John Mundy's photo is at right, Trabas has a fine photo, John Cullen also has a good closeup, Wikimedia has several distant views, Marinas.com has aerial photos, Huelse has a historic postcard view, David Rowley has a distant street view, Douglas Holms has a street view from the patio at the base of the tower, and Google has a satellite view. The lighthouse was built to warn ships away from the Bristo Rock offshore. It now stands on the 10th hole of a large and well known golf resort, site of the Open Championship in 1977, 1986, 1994, and 2009. 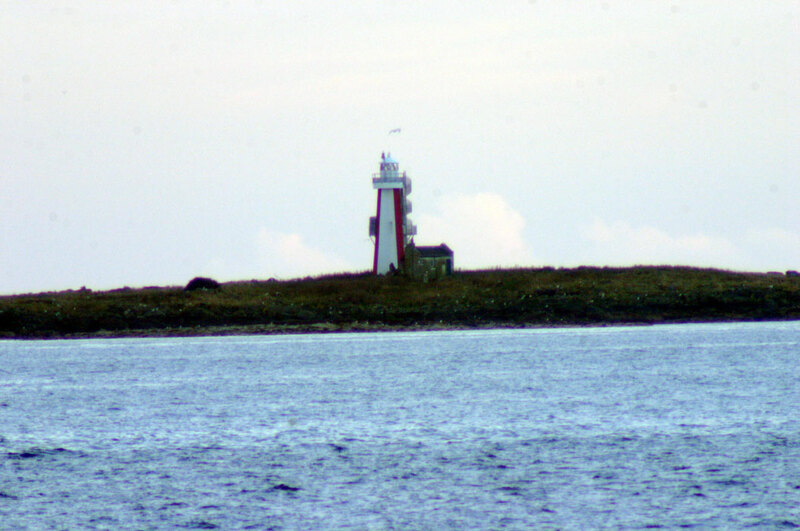 In May 2012 it was proposed that the lighthouse be deactivated; instead, it was solarized and downgraded in importance in October 2013. Donald Trump purchased the resort in April 2014. In February 2015 the Trump Organization announced plans to renovate the lighthouse for overnight accommodations as part of the resort; completed in June 2016, the lighthouse suite rents for an eye-popping £3500 per night. 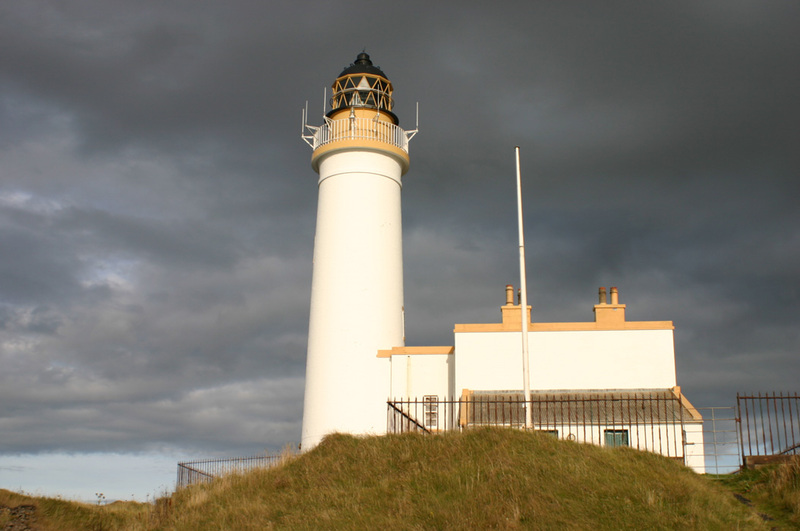 Located just off the A719 coastal road about 1.5 km (1 mi) north of the A77 at Turnberry. Site restricted to resort guests, tower closed. Operator: Northern Lighthouse Board. Site manager: Trump Turnberry Resort. ARLHS SCO-248; Admiralty A4580; NGA 4772. 1811. Inactive since around 1850. 4 m (13 ft) round sandstone tower with an opening on the seaward side; the top of the tower is an open chimney. A fire was built in the tower when vessels were approaching. A stone wall attached to the lighthouse concealed the fire until the vessels were clear of nearby shoals: a very unusual "sectoring" of an open fire light. Ann Cook has a 2013 photo and a more distant view, a closeup of the rear of the tower is available, and Google has a street view and a satellite view. This little tower is a rare survivor of a much earlier day in lighthouse history. Michel Forand spotted photos of this forgotten lighthouse, and Michael Spencer visited the site in November 2007 to determine its history. It was abandoned when local coal seams played out in the 1850s and coal was no longer shipped from the harbor. The tower has been placed on the Buildings at Risk Register for Scotland. Located on the west breakwater at Dunure, a village about 10 km (6 mi) southwest of Ayr. ARLHS SCO-372. 1877. Active; focal plane 7 m (23 ft); quick-flashing white light; also a continuous green light at 5.5 m (18 ft). 6 m (20 ft) round cylindrical cast iron tower, painted white. The lights are displayed through two windows in the tower. An August 2006 photo shows the lighthouse freshly painted, but Melanie Hillock's September 2007 photo shows it covered with graffiti. Trabas has a closeup photo, Huelse has a historic postcard view, and Google has a satellite view and a street view from the base of the pier. An unusual old pierhead light. 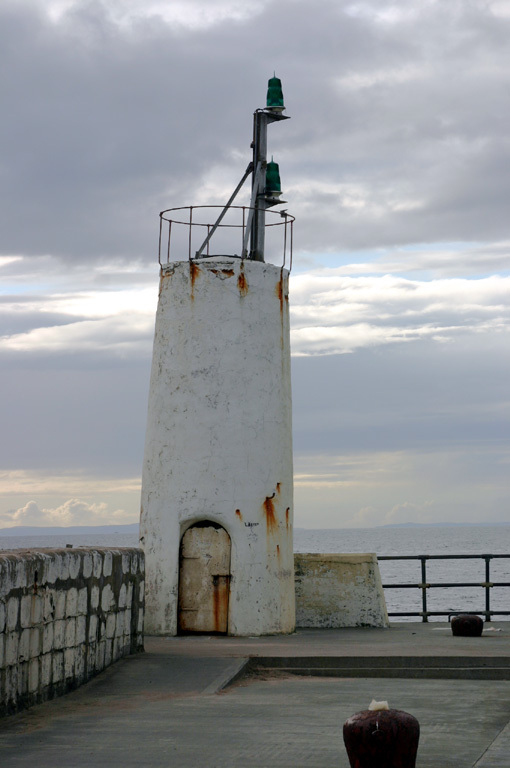 Located at the end of the south breakwater mole at Ayr. Accessible by walking the mole. Site open, tower closed. Operator: Port of Ayr. ARLHS SCO-292; Admiralty A4568; NGA 4760. 1841 (Robert Paton). Active; focal plane 10 m (33 ft); continuous red light. 6 m (20 ft) round tower with lantern, mounted on a square stone base. Tower painted red, lantern white; the stone base is unpainted. Trabas has a good photo and Google has a satellite view. Located at the foot of Harbour Street in Ayr, next to the pilot house. Site and tower closed. Operator: Port of Ayr. ARLHS SCO-293; Admiralty A4574; NGA 4752. 1841 (Robert Paton). Active; focal plane 18 m (58 ft); red light, 8 s on, 2 s off. 22 m (72 ft) round masonry tower with lantern and gallery. Tower unpainted, lantern and gallery painted white. Trabas has a photo by Arno Siering, Dries De Roeck has a daytime photo, his nighttime photo shows the lighthouse in action, another good photo is also available, and Google has a street view and a good satellite view. Located at the foot of Harbour Street in Ayr. 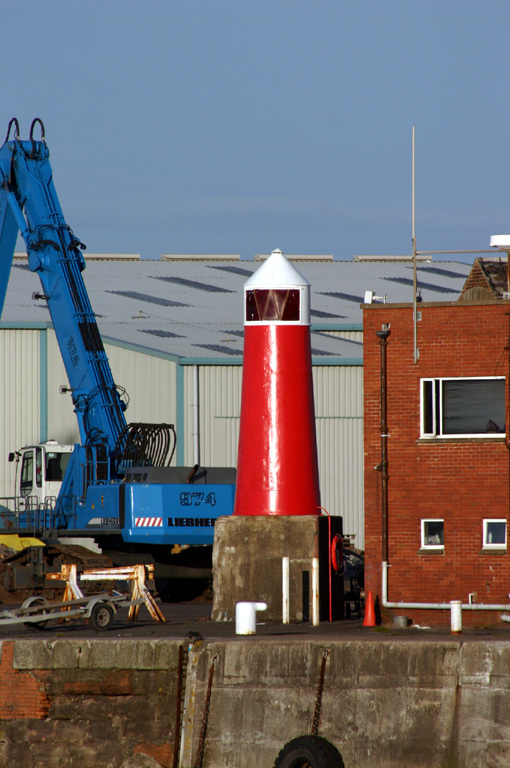 Site and tower closed, but the lighthouse can been from South Harbour Street across the River Ayr. Operator: Port of Ayr. ARLHS SCO-294; Admiralty A4574.1; NGA 4756. 1913. Active; focal plane 9 m (30 ft); quick-flashing red light. 5 m (17 ft) square cast iron skeletal tower with enclosed upper portion, painted white. Trabas has a closeup, William Reynolds has a good photo, and Google has a satellite view. 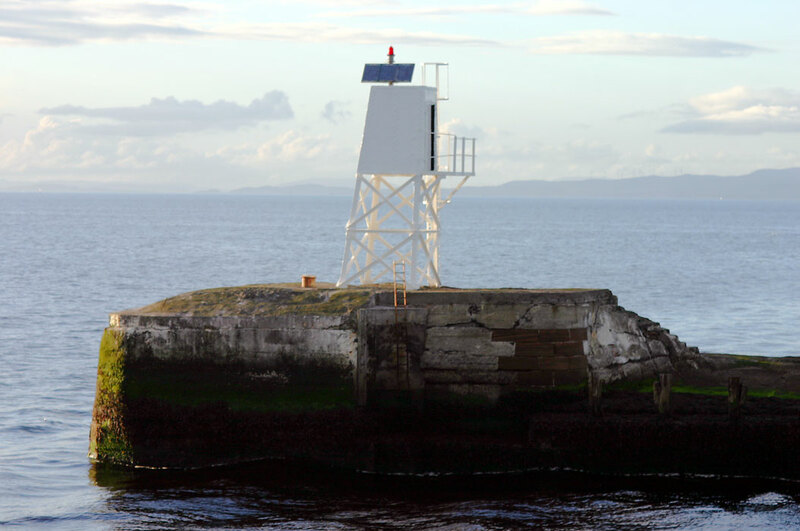 Located at the end of a short detached breakwater on the north side of the entrance to Ayr Harbour. Accessible only by boat. Site open, tower closed. Operator: Port of Ayr. Admiralty A4566; NGA 4764. 1903 (David A. and Charles Stevenson). Active; focal plane 19 m (62 ft); four white flashes every 30 s. Approx. 15 m (49 ft) pyramidal concrete tower with lantern, gallery, and external spiral stairway. Lighthouse painted white with a red vertical stripe on each face. Robert Dawson's photo is at right, Trabas has a view from the sea, Wikimedia has several photos, Marinas.com has aerial photos, Huelse has a historic postcard view, and Google has a satellite view. Richard Webb's photo was taken in 2000 before the red stripes were added. This is an unusual lighthouse; its cross-section is the shape of a plus sign (+) and the stairway spirals up around an iron pole placed next to the tower. South of the lighthouse is a conical rubblestone tower about 10 m (33 ft) tall that must have served as a daybeacon before the lighthouse was built. The island is a privately owned bird sanctuary; landing is forbidden without special permission. Located about 5 km (3 mi) west southwest of Troon. Site and tower closed. Operator: Northern Lighthouse Board. ARLHS SCO-117; Admiralty A4562; NGA 4744. 1904 (rebuilt in 2010; station established 1848). Active; focal plane 11 m (36 ft); two flashes, white or green depending on direction, every 6 s. 8 m (26 ft) round cylindrical cast iron tower with lantern, on a concrete base. Lighthouse painted white with black trim. Trabas has a photo, and Google has a satellite view. The lantern, gallery, and stairway were replaced in 2010. Ian Paterson has a 2008 closeup showing the previous appearance of the lighthouse, Marinas.com has aerial photos, and Sarah Charlesworth has a 1973 photo. Located at the end of the west pier, which also functions as a breakwater for Troon Harbour. Accessible by walking the pier. Site open, tower closed. Operator: Port of Troon. ARLHS SCO-247; Admiralty A4554; NGA 4732. 1898 (station established 1840). Active; focal plane 11 m (36 ft); white or green light, depending on direction, 2 s on, 2 s off. 9 m (29 ft) octagonal cylindrical cast iron tower with lantern and a narrow gallery. mounted on a square black stone base. Lighthouse painted white, lantern roof black. W.F. Millar's photo is at right, George Gallagher has a good closeup photo, Trabas has a photo, Marinas.com has good aerial photos, and Google has a street view and a satellite view. Located at the end of the ferry pier in Ardrossan; ferries depart from this pier for Brodick on the Isle of Arran. Accessible by walking the pier. Site open, tower closed. Operator: Clydeport. ARLHS SCO-317; Admiralty A4538; NGA 4704. Note: The Isle of Arran is the largest island of the Firth of Clyde. Located on the west side of the firth, it is closer to the Kintyre Peninsula than it is to the rest of North Ayrshire. Arran is accessible by ferry from Ardrossan on the east side of the firth. 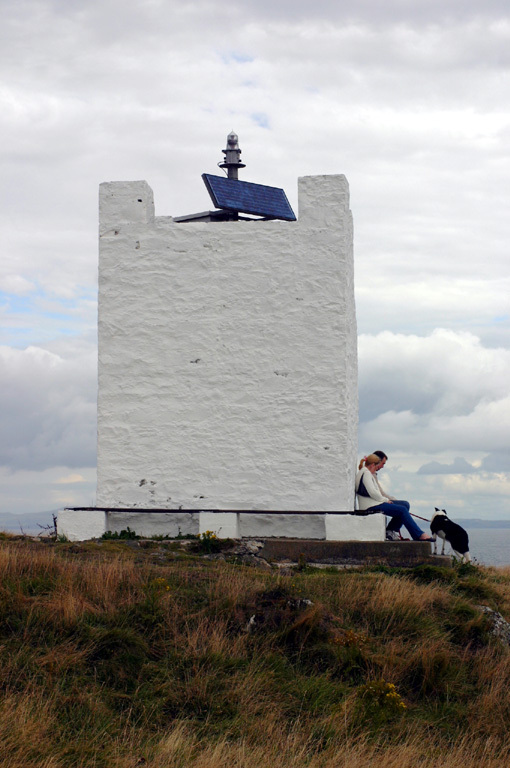 Its lighthouses, however, are on two smaller islands just offshore: Holy Isle to the east and Pladda to the south. Early 1790s. Inactive since 1901. 13 m (43 ft) masonry tower with lantern and gallery, painted white with buff trim, located near the base of the high tower. Trabas has an excellent photo by Ina Rendtel. 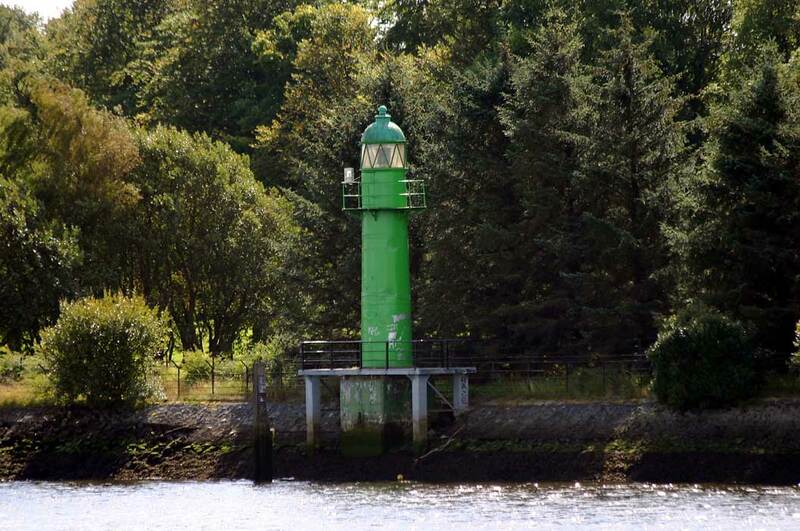 This light was added to distinguish Pladda from other lights along the Clyde. The Northern Lighthouse Board web site records that the lower light was active for more than 100 years, although it does not give exact dates. ARLHS SCO-352. 1790 (Thomas Smith). Active; focal plane 40 m (131 ft); three white flashes, separated by 3.1 s, every 30 s. 29 m (95 ft) round masonry tower with lantern and gallery. Lighthouse painted white with buff trim; lantern painted black. 1-story keepers' house and other buildings. 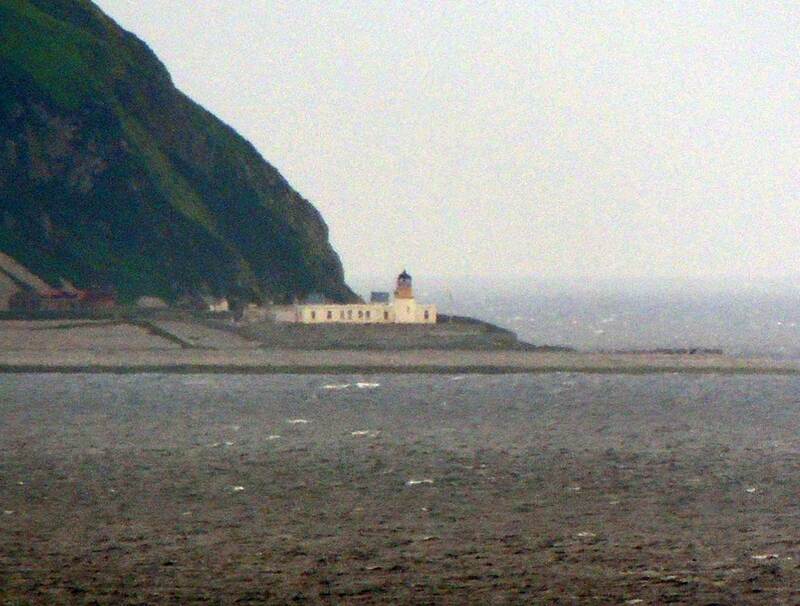 The light station guides ships entering the Firth of Clyde. Trabas has an excellent photo by Ina Rendtel, Tony Page has a good photo, Wikimedia has distant views, Marinas.com has aerial photos, Huelse has a historic postcard view, and Google has a satellite view. Fred Fox recalls a 1973 visit. Pladda is a small, teardrop-shaped island about 1.5 km (1 mi) south of Kildonan, off the southern point of the Isle of Arran. The island was sold into private ownership in 1990. Located on the highest point of the island. Accessible only by boat; there are excellent views from coastal sites throughout the Kildonan area. Site and tower closed. Operator: Northern Lighthouse Board. ARLHS SCO-172; Admiralty A4326; NGA 4316. 1905 (David A. and Charles Stevenson). 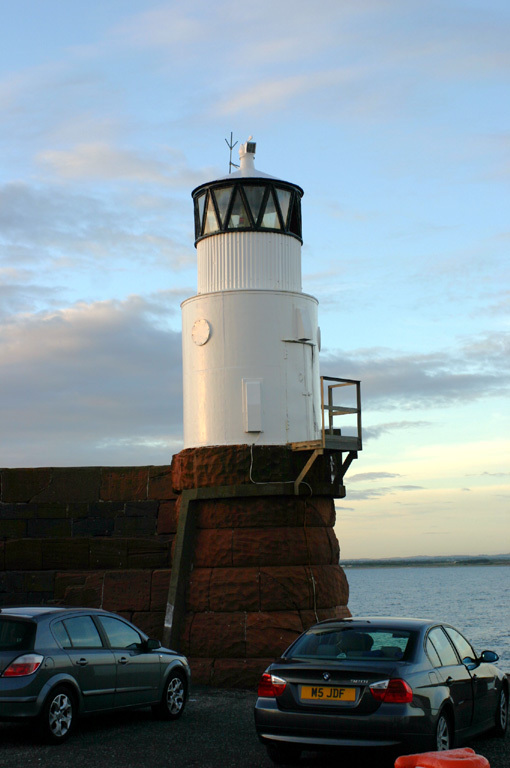 Active; focal plane 38 m (124 ft); two white flashes every 20 s. 23 m (75 ft) square cylindrical masonry tower with lantern and gallery. Lighthouse painted white with buff trim; lantern painted black. A photo is at right, John Wesley Barker has a photo, a closeup is available, L.J. Cunningham has a view from the sea, Huelse has a historic postcard view, and Google has a satellite view. Holy Isle, located off the east coast of the Isle of Arran, earned its name as the home of St. Molaise in the 6th century. Now it is holy to another religion; since 1992 the entire island has been owned by a Buddhist community. However, visitors are welcomed and there is a passenger ferry service from Lamlash. 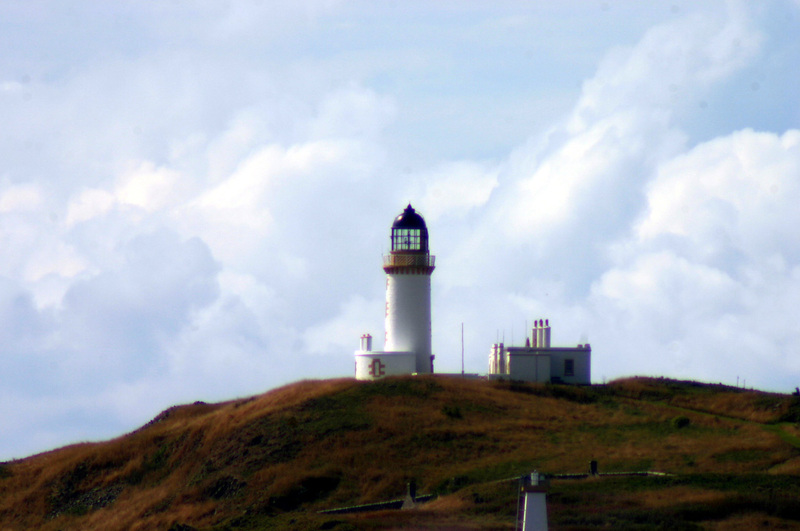 This lighthouse is the third (after Sanda and Pladda) in the series of lights guiding ships into the Firth of Clyde. Located at Pillar Rock Point, the southeastern point of the island, about 1200 m (3/4 mi) northeast of the inner lighthouse. Accessible by hiking trail. Site open, tower closed. Operator: Northern Lighthouse Board. Site manager: Samyé Ling Buddhist Community. ARLHS SCO-100; Admiralty A4330; NGA 4320. 1877 (Thomas and David Stevenson). 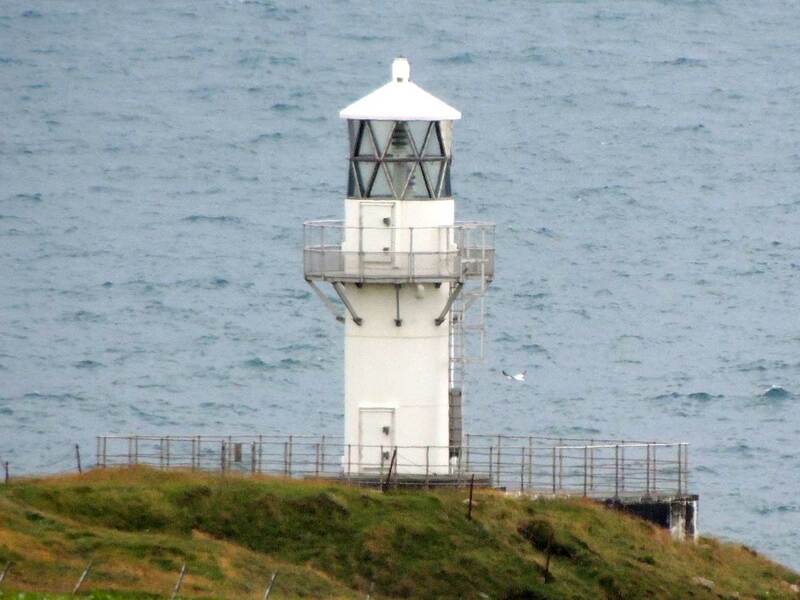 Active; focal plane 14 m (46 ft); green flash every 3 s. 17 m (56 ft) round cylindrical masonry tower with lantern and gallery. Lighthouse painted white with buff trim; lantern painted black. The keeper's houses are privately owned and occupied by Buddhist monks and nuns. John Duff has a 2007 photo, L.J. Cunningham has a photo, Marinas.com has aerial photos, Huelse has a postcard view dated 1904, and Bing has a satellite view. The previous entry has information on the island. 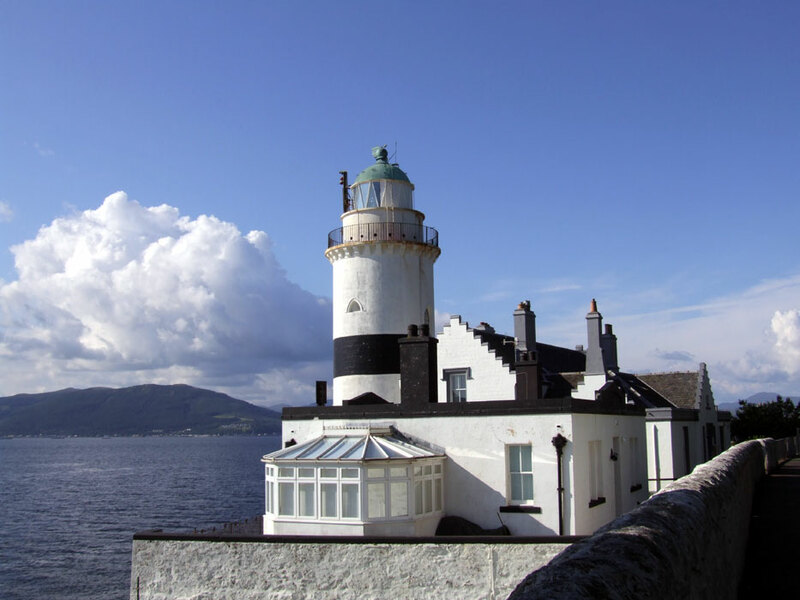 The inner lighthouse is located at the southwestern corner of the island opposite Kingscross Point on Arran; it marks the southern entrance to Lamlash Bay, which separates Holy Isle from the mainland of the Isle of Arran. Site open, tower closed. Operator: Northern Lighthouse Board. Site manager: Samyé Ling Buddhist Community. ARLHS SCO-101; Admiralty A4332; NGA 4328. 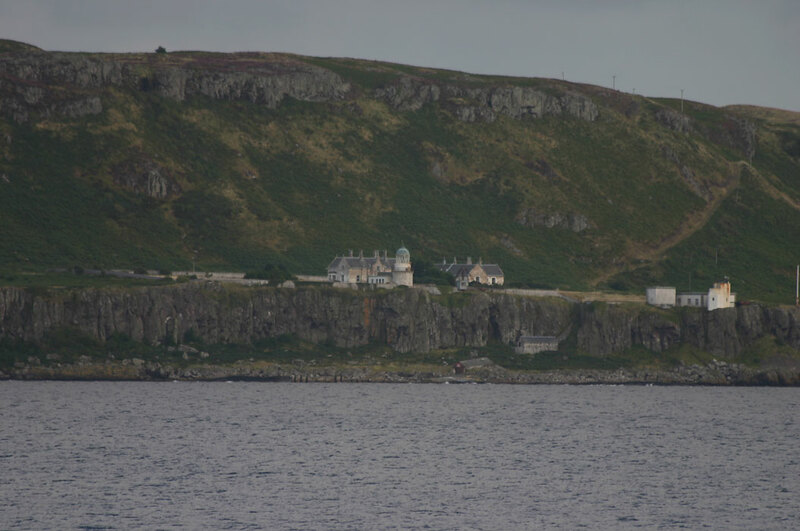 Note: Little Cumbrae is an island in the middle of the entrance to the Upper Clyde estuary from the broader waters of the lower Firth of Clyde. The island is privately owned. 1757. Inactive since 1793. 8.5 m (28 ft) round cylindrical stone tower. Graham Wilson has a 2007 closeup photo, Eddie Dowds has a distant view, and Bing has a satellite view. 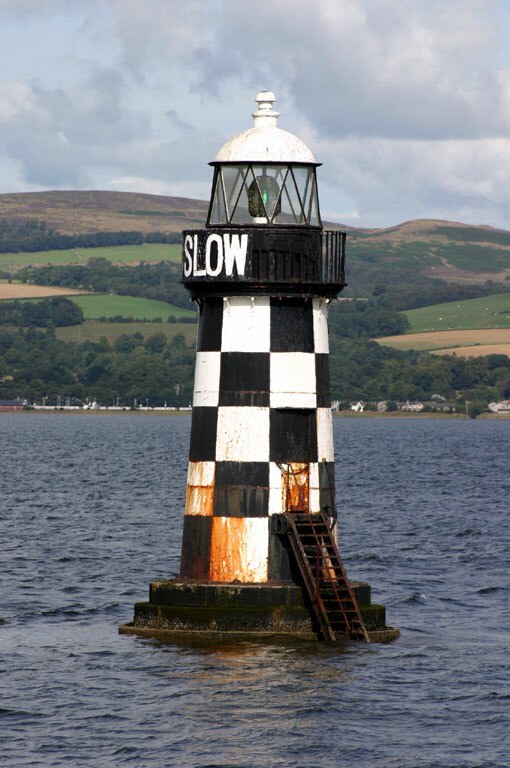 Intended as a landfall light for the upper Clyde, this is one of the first Scottish lighthouses. An open fire was kept atop the tower. Located on Lighthouse Hill, the highest point of the island, at an elevation of about 123 m (404 ft). Site and tower closed. ARLHS SCO-359. 1793 (Thomas Smith) (station established 1757). Inactive since 1997. 11 m (36 ft) round cylindrical stone tower, unpainted, with lantern and gallery. Neil Robertson contributed the photo at right, Trabas has a view from the sea, Wikimedia has several views, Marinas.com has fine aerial photos, Huelse has a historic postcard view, and Bing has a satellite view. Endangered: Peter Ribbeck's 2007 photo shows this lighthouse to be deteriorating, and it is certainly threatened by erosion. Robert Stevenson supervised the construction of the 1793 tower, thus inaugurating the Stevenson family's long association with Scottish lighthouses. In 2003 the island was purchased by a businessman who intended to build a corporate conference center. These plans did not bear fruit, and by September 2005 the island was again for sale with an asking price of £2.5 million. In 2009 the island was sold to Sarwan and Sunita Poddar, who have opened a center for yoga and meditation. Located on the west side of the island marking the east side of the entrance to the Clyde estuary. Site and tower closed. ARLHS SCO-316. 1997 (station established 1757). Active; focal plane 28 m (92 ft); white flash every 6 s. 11 m (36 ft) hexagonal cylindrical tower. Richard Webb has a photo, the light is at the far right in Trabas's view from the sea, and Bing has a satellite view. Located on the west side of the island marking the east side of the entrance to the Clyde estuary. Site and tower closed. Operator: Clydeport. ARLHS SCO-123; Admiralty A4346; NGA 4336. Note: Now divided into three council areas, the historic county of Renfrewshire faces north on the upper Firth of Clyde (often called the River Clyde), an estuary leading eastward to the city and port of Glasgow. 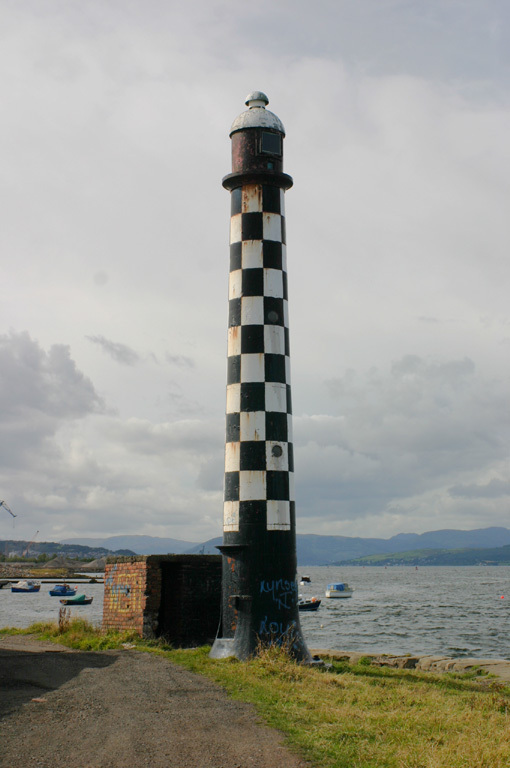 For lights on the north side of the Clyde, see the Argyll and Bute page. Note: Inverclyde ("Mouth of the Clyde") is a small council area at the western end of the historic county of Renfrewshire. 1797 (John Clarkson and Thomas Smith). Active; focal plane 24 m (79 ft); white flash every 3 s. Approx. 14 m (46 ft) round cylindrical stone tower attached to 1-1/2 story stone keeper's house. Buildings painted white; tower has a single narrow black horizontal band. Keeper's house used as a residence. Thomas Nugent's photo is at the top of this page, Trabas has a good closeup photo by Arno Siering, Kevin Cotterell has a 2008 photo, Eric Wyllie has a winter sunrise photo, Wikimedia has several photos, Huelse has a historic postcard view, Google has a street view, and Bing has a satellite view. 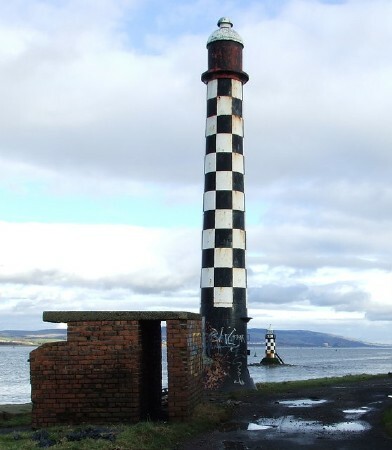 This historic light station marks a right-angle curve in the Clyde, where the estuary turns from north to east for ships bound for Glasgow. Located just off the A770 highway about 3 km (2 mi) west of Gourock, directly across the Clyde from Dunoon. Site open, tower closed. Operator: Clydeport. ARLHS SCO-047; Admiralty A4404; NGA 4404. Date unknown. Active; focal plane 18 m (59 ft); quick-flashing green light. Approx. 15 m (49 ft) square brick and metal terminal control building. Trabas has a closeup photo, Google has a street view, and Bing has a satellite view. The rear light is on a skeletal communications tower. 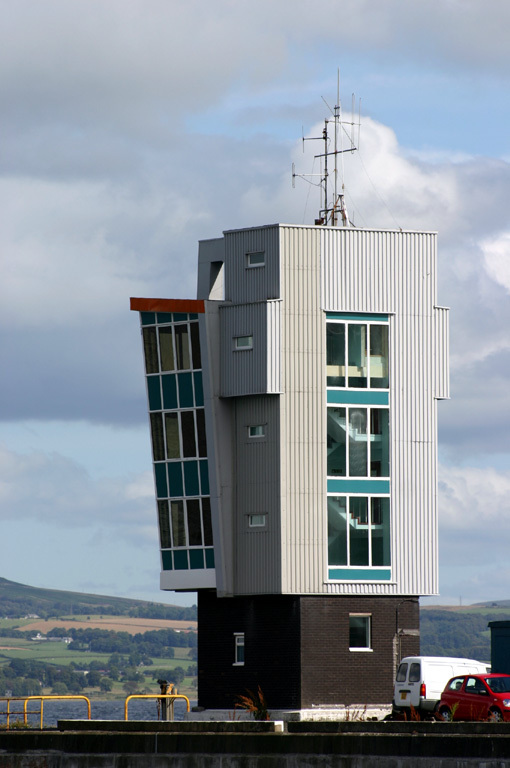 Located at the west end of the quay at the container ship port in Greenock. Site status unknown, but the building is easy to see from nearby. Admiralty A4442; NGA 4564. Date unknown. Active; focal plane 7 m (23 ft); quick-flashing green light. 4 m (13 ft) round cylindrical stone tower, painted green. Lantern removed; the light is shown from a short mast atop the tower. Trabas has a good photo, and Bing has a satellite view. 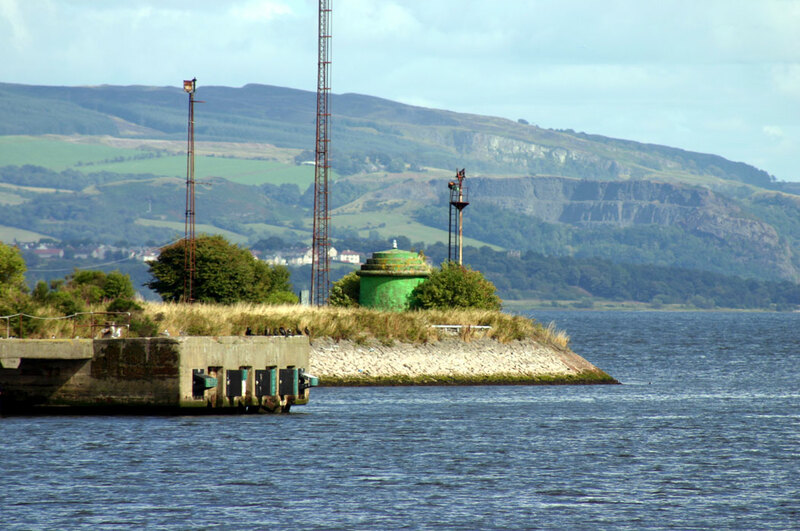 Located at the eastern end of the Garvel Embankment, which shelters the eastern harbor at Greenock. Site and tower closed, but the light can easily be seen from the waterfront near the shipyards. Operator: Clydeport. ARLHS SCO-351; Admiralty A4472; NGA 4584. 1921. Active; focal plane 12 m (39 ft); continuous green light. 11 m (36 ft) slender round cylindrical cast iron (?) tower with lantern but no gallery, painted in a black and white checkerboard pattern; lantern dome is white. Trabas has a closeup photo, Peter Goulding has a good photo, Thomas Nugent's photo at right shows the Port Glasgow light in the background, Google has a street view, and Bing has a satellite view. Located on the quay at Port Glasgow. Site open, tower closed. Operator: Clydeport. ARLHS SCO-312; Admiralty A4478; NGA 4592. 1919 (station established 1861). Active; focal plane 7 m (23 ft); continuous green light. 7 m (23 ft) round tower with lantern and a narrow gallery. Lighthouse painted in a black and white checkerboard pattern; lantern dome is white. Trabas has a fine photo, Peter Goulding has a page with good photos, Thomas Nugent has an excellent photo, Marinas.com has aerial photos, Google has a street view, and Bing has a satellite view. Located on a rocky ledge about 200 m (220 yd) off the Port Glasgow waterfront. Accessible only by boat, but easily seen from the waterfront. Site and tower closed. Operator: Clydeport. ARLHS SCO-311; Admiralty A4476; NGA 4588. 1921 (station established 1868). 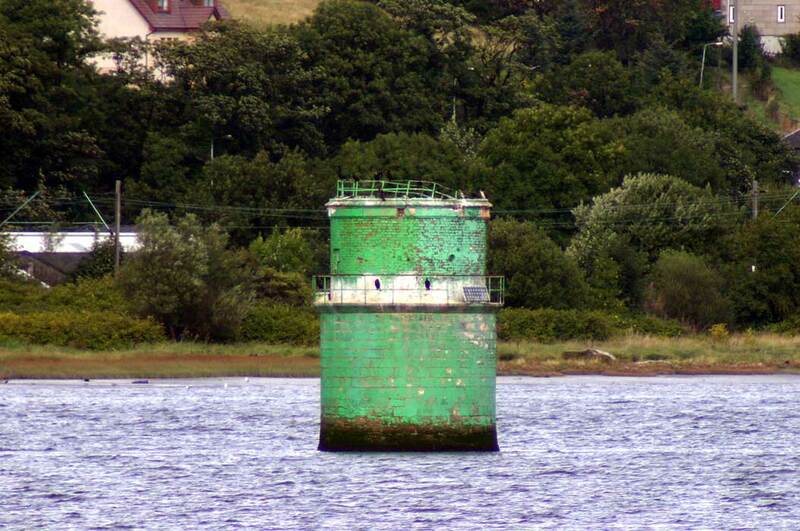 Active; focal plane 10 m (33 ft); green flash every 2 s. 12 m (39 ft) round cylindrical 2-stage stone tower, painted green. Trabas has a good photo, Richard West has a photo, and Google has a satellite view. Located on the south side of the Clyde channel just above Dumbarton. Accessible only by boat. Site and tower closed. ARLHS SCO-367; Admiralty A4486; NGA 4600. 1921 (station established 1905). Active; focal plane 10 m (33 ft); green flash every 2 s. 11 m (36 ft) round cylindrical cast iron tower with lantern and gallery, painted green, mounted on a square concrete platform supported by four concrete piles. Thomas Nugent has a closeup photo, Trabas has a good photo, and Google has a satellite view. Surrounding the lighthouse is the golf course of the Renfrew Golf Club. Located on the south side of the Clyde just above the confluence of the River Cart in Renfrew. The lighthouse appears to be accessible along a riverfront walkway. Site open, tower closed. ARLHS SCO-363; Admiralty A4512; NGA 4656. Barnkirk Point (Annan) (1841-1960s? ), mouth of the River Annan, Solway Firth. Lighthouse Digest has a historic postcard view contributed by Michel Forand. The original lighthouse was replaced in the late 1890s; the second lighthouse was destroyed by fire in the 1960s. A mast on the foundation might have carried a light. Google has a satellite view of the location, but the mast is not seen. Posted October 19, 2004. Checked and revised June 30, 2018. Lighthouses: 37. Site copyright 2018 Russ Rowlett and the University of North Carolina at Chapel Hill.